JellyCar 2 is a tricky one. It's a quality driving-platforming game with a variety of content; and while that really should be all that matters, the fact is you can download the game for $4 cheaper on an iOS and get more content. Paying more for less stinks. That's obvious. 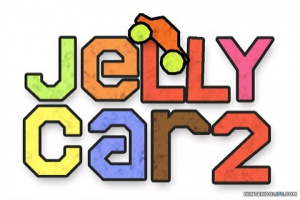 But if the DSi is all you've got, the fact remains: JellyCar2 is is a quality game. Now, it wants you to think it's stylish, but it unfortunately walks on the wrong side of the line separating "charmingly minimalist” and “lazy.” The DSiWare size limitations haven't been kind to it either, meaning some of the vibrancy has been lost in the transition; and on top of that, there's this weird (though apparently intentional) “static” effect on the platforms and environmental objects that's both distracting and ugly. 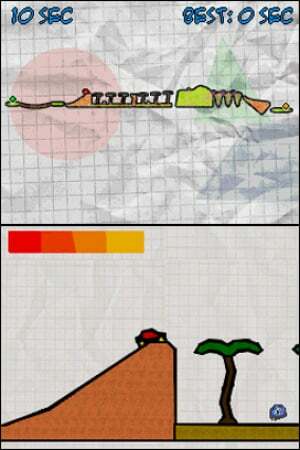 Thankfully, there's enough fun packed in the game's numerous levels to overcome its visual shortcomings. Each level in JellyCar2 is like a little obstacle course race; your goal is always to get your gelatinous vehicle to the target at the end of the level, but you'll have to use power-ups and the game's physics engine to your advantage if you want to get the best time. 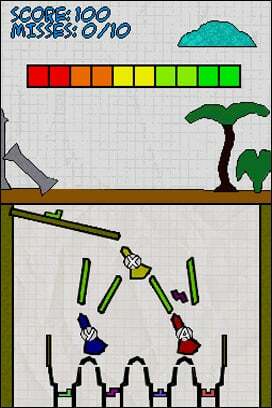 There are two main power-ups in the game: sticky wheels and balloons. Sticky wheels, which you can toggle on and off, allows your JellyCar to drive on walls and ceilings while balloons do pretty much exactly what you'd expect them to do. The latter tends to be problematic and cumbersome to control, but it's thankfully not used all that often. In addition to these pickups your car also has the ability to grow at any time with a tap of the R or L buttons. Stretching your car to a massive size can help it cross over small gaps with ease, though a power meter on the top left corner of the screen drains as you use it. The physics engine, which helps gives the JellyCar its bouncy, whimsical handling, is simultaneously the best and worst part of the game. On the plus side, the car is fun to control as it jiggles and wobbles through the environment, since it has a real sense of weight about it. What's not always so fun is the “weight-shifting” mechanic. Pressing left or right on the control pad will shift your car's weight to the corresponding side, allowing it to flip over and even climb small stair cases. It works in theory, but it can be a little inconsistent in practice; a bit frustrating if you're going for high scores. JellyCar 2 also has something that's rare in DSiWare games these days: content that stretches beyond the main mode of play. In addition to the numerous primary levels (which span across three difficulty levels) there are also two bonus games that are actually almost as fun as the main attraction. Long Jump is the best of the two, and the most self explanatory. You send your JellyCar down one of three enormous ramps (each with their own obstacles and challenges) and try to see how far you can get it to fly before it hits the ground. The other bonus mode, Factory, is a strange inclusion, as it has very little to do with jelly or cars, though it's fun in its own right. Essentially, unnamed, amorphous “parts” will fall down a chute in a factory and you have to send them to the correctly coloured bin by altering the path they're traveling on. It's much more fun then we're making it sound. Promise. Unfortunately, one of the game's staple components, the Level Editor, has been eschewed completely for the transition to DSiWare. If you own an iOS device, there's no point in downloading this version of the game — you'd be paying significantly more money for less content. All else considered, though, this is still DSiWare done right: fun, pick-up-and play-style gameplay with a variety of options and tons of replay value. A few missteps and an iffy price-point notwithstanding, this is a quality download that mostly overcomes its shortcomings. I just never could get into the iOS releases. The game was fun for me for about 15 minutes and then I totally lost interest in them. It's not my cup of tea really. Same situation--fun for a bit, then I lost interest. But I appreciate what it's doing and I can see how some would find it really enjoyable. I agree. It's a very popular game on the App store, so there are a lot of people who do like it. I downloaded this and liked it. Although I think getting another 500 point game would've been better. O___O those graphics will not do at all. Please tell me they look better in person. 500 points seems overpriced; if I ever get an iPod Touch I might consider this but on DSiWare it's a no go for me. Ah. ok, I won't be getting this then, lol, because honestly, the graphics were one of the charms of the iTouch version to me. lets see i have like 12 bucks so...when cut the rope comes out, with is 5 bucks, Ill then have something like 6 bucks left....I think. Ug. Math. Eshop tax. Whatever.